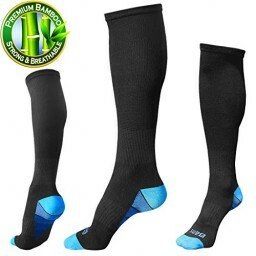 BAMS Black All-Day Premium Bamboo Compression Socks 99% OFF!!! COMPRESSION FOR ALL YOUR NEEDS Benefit from the most technically advanced performance sock! Our ARCH and ANKLE zoned gradient compression system will support your legs, increase your blood flow and help YOU recover faster! Introducing the only sock designed for both fitness and business: Our pattern won't stick out when wearing shoes. Look professional at the office OR sporty at the gym and enjoy our medically tested Ultra-Stretch technology anywhere! DOCTOR RECOMMENDED Our premium bamboo fibers are clinically proven as the best for sensitive skin and allergies. Enjoy fresh feet all-day long with our antibacterial, odor-resistant Bamboo fiber! Highly recommended for travel, prolonged standing, nursing, expecting mothers and diabetics. Say goodbye to toxic exposure of cotton and polyester chemicals commonly used in the textile industry that can irritate your skin! Our organic fibers are grown with 1/3 the amount of water used to grow cotton with NO pesticides/chemicals! DURABILITY Our ultra-soft breathable socks are double-stitched and guaranteed not to rip for long-lasting comfort, wash after wash! 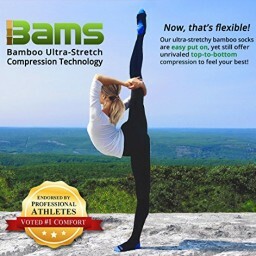 Buy from the ONLY US-BASED company dedicated to providing you the highest quality bamboo compression backed by our 100% Satisfaction Guarantee! If your size is in the middle, size down for more compression. Ordered These Compression Socks, I Wear Kid Size Shoes But My Calves Are Still Plus Sized, So They Didn't Fit Me But My Mom Tried Them Out For Me, She Said They Were Really Soft And Were Really Great Pair Of Socks. Only Thing They Needed Were Non Skid Soles And They Would Be Perfect! She's Wore Them A Couple Times Already! I Got These Socks For My Mom Who Is On Her Feet All Day At Work And Suffers From Swelling And Leg Pain. They Have Really Helped With Both Those Issues! Theyre Very Soft And Provide Arch And Heel Support. They’re Comfortable To Wear, Stitched Extremely Well And Stay Door Free. I Like That They Have Different Colors To Choose From Too. Just Purchased These Compression Socks. They Are Extremely Comfortable And Fit Very Well. I Love The Color And The Blue Accent At The Toe/heel. I Plan To Use Them When Going Hiking, Or For Working When I’m Standing For 8+ Hours. Will Likely Get Another Pair In The Future! Checking Out Some Socks To Help My Sweaty Feet. These Did A Pretty Good Job Today. I Really Enjoyed These Compression Socks, They Have Just The Right Amount Of Compression To Help Get My Blood Flowing Since I Have High Blood Pressure. My Doctor Even Said They Have Been Helping Regulate My Blood Pressure. I Would Definitely Recommend Them Considering My Doctor Even Said She Would Recommend Them To Her Other Patients. They Also Are Very Comfy To Wear And Are A Very Soft Material. There Is Nothing That I Didn't Like Pertaining To These Socks. Love These Socks! They're Very Comfortable And Keep My Legs And Arches Supported Through Any Long Days. They're Well Made And Haven't Lost Any Elasticity Or Their Original Shaping. They Have A Thicker Hill And Are Tight So I Don't Get Any Discomfort From My Shoes Or Boots Rubbing On My Feet. If You Get Tired Or Achy Feet Or Need A Mild Compression Sock For Your Legs, Give Them A Try. I Often Suffer With Leg Cramps, It's A Condition Associated With My #MS. I Recently Ordered A Pair Of Bams Sport LLC Compression Socks And Was Extremely Pleased With How They Made My Legs Feel. One Of The Best Features Is How The Compression Isn't Too Painful. It's The Perfect Amount Of Squeeze Without Pain. I Also Liked How Soft And Luxurious The #bamboo Fibers Were. They Are Knee Length That Offers Your Entire Calf Muscle The Relief Needed For Some Of The Worst Muscle Cramps. I Highly Recommended Buying A Pair Of These Awesome Compression Socks! You Can Find Them Here At Http://amzn.to/2rpvAOG (affiliate Link - If Clicked And A Purchase Is Made, I Will Make A Small Commission At No Cost To You! This Enables Me To Buy Things Like Paperclips & A Koolaid Packet.) OR Check Out Their Facebook Page And Discover How You Can Get These Compression Socks At 80% Off! Hurry Before This Offer Expires!! Great Product For Any Time Of The Day And Any Activity That You Might Run To. I Find These Socks To Have A Great Compression, Making You Feel Your Legs More Active And Light, Helping You Walk And Doing Exercise. The Packaging Is Good It Came In A Little Box And I Really Like That They Are Made From A Supervised Bamboo Farm So The Company Is Concern. I Recommend This To Anyone That Works In An Office For 8 Hours A Day And Also For Anyone That Exercise Daily. Also I Have To Say In My First Order I Receive A Large Sock And Small Sock And The Company Reach Out To Me And Did Everything To Solve The Problem, I Have To Say It Was A Great Support From Them I’m Not Mad At All, That’s The Support That Every Company Needs To Give To Their Clients Even Tho I Just Bought Just One Pair Of Socks They Treated Me Like A Special Client. BAMS Black All-Day Premium Bamboo Compression Socks Are Amazing! They Are Super Comfy, Long For Wearing With Tall Boots (a Must In MT Winter), And Provide Extra Support On Those Days When I'm On My Feet All Day. Additionally, I Love The Way They Look! Great Quality, Great Socks, GET YOU SOME. 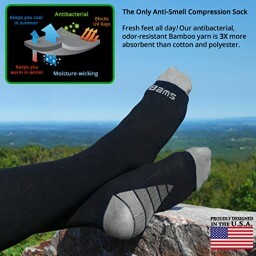 I Have Been Wearing BAMS All-day Bamboo Compression Socks....off And On For Over 2 Weeks Now. I Like The Tingle Feeling My Legs, Especially My Calves Have From Them. They Can Be At Times A Little Hard To Get Off My Legs At Times, But That Is Typically How Many Compression Items Can Be. I Also Like How My Legs And Feet Felt Cool When I Touched Them. No Sweating At All. Https://www.giveawayservice.com/p/u6g4m6r7/t4f3z0u3j2 Product Review: Tried Out These Compression Socks And Really Liked Them. Very Comfortable As I Forgot I Had Them On After 20 Minutes. I Like That The Coloring Of These Socks Because All Of The Bright Colors Are Below The Shoe Line. 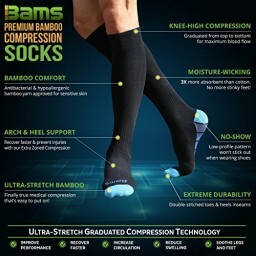 BAMS Black Bamboo Compression Socks For Men & Women.I Would Recommend These Socks To Anyone That Is On Their Feet For A Long Period Of Time. Https://www.giveawayservice.com/p/u6g4m6r7/p9k7z0i2k1 One Of The Best Compression Socks I Have Ever Bought. Works Very Effectively And Not At All Expensive. Fits Well And It Has Been 3 Months And No Issues. Washable. Five Stars. I Love The Compression Socks I Received. They Help With Swelling And Have Made A Difference In My Sore Feet. I Also Like That They Come All The Way Up Tp My Knees As That Adds Extra Warmth On A Cold Day. The Customer Service Has Been Fantastic And They Got Back To Me Right Away When I Had Questions! These Socks Have A Nice, Firm, Grip Around Your Calves And Feet. The Fabric Is Soft And It Definitely Helps With Circulation! It Has Been Easier To Stand For Long Periods Of Times With These Socks And I'm Excited To Use Them For Cross-country Skiing. The Sleek Design Also Allows You To Wear Them With Almost Any Outfit!